Armenians, who migrated from Balkans to Minor Asia more than two thousand years ago, settled in different historical periods on Oghuz land – the present Armenia territory and did their best to assume possession of the material-cultural monuments of ancient Turkis, Albanians, Georgians and other local residents. Armenian churchmen tried to adapt “Khays historyff for the Gospel, history of ancient states which governed the territories, and existing toponyms. In researches having been conducted as early as through XVHI-XIXcenturies some European historians, including La Kroz, A.Gutshmid, A.Carrier, wrote about consisting the manuscript repre­sented as ” History” work after Moisey Khorenatsi from cover to cover of anachronisms, its compiling not in V century, but later through copying cer­tain fragments from different books. The aim of writing all this is to reveal the fact of being ancient Armenian history fully counterfeited, the present Armenia territory’s never being Armenians’ historico-ethnical homeland, their settling in these territories with vestige of false history later on written by Armenians. Prior to the latters settling on the present Armenia territory the local toponyms fully consisted of Turkic names in view of populat­ing the territories by ancient Turkis. The fact is betokened by tax note-books having been compiled since XVI century on these territo­ries, and by returns of censuses conducted in Russia in the early XIX century after South Caucasus occupation. most of them were settled by the migrant Armenians. The first name-changing opera­tion on the present Armenia territory was con­ducted in the first half of XIX century. Thus, Iravan was changed for Erivan (1828), Kavar-for Novo-Bayazet (1837), Gumru – for Alexandropole (1840). After genocide acts 1905-1906 and 1918-1920 against Turkis in Erivan province Turkic villages were factically raized to the ground, most of their dwellers became refugees. Only after concluding Moscow and Kars Treaties 1921, small number of the local Turkis suc­ceeded in returning to their populated areas. And most of the villages were seized by Armenian migrants from Turkey. The maps and statistical data, having been published under Tsarist Russia, retained Turkic names of the settlements as they were. The first official name-changing operation in Armenia was launched in 1919 under Dashnaks. In December of the year Commission, set up by the decision of Armenian Ministries Council, was charged to “restore historical names” of towns, villages, mountains, rivers. The first official name-changing operation in Soviet Armenia had been conducted from 1935 by the decrees of Supreme Council. Afterwards the names were changed in 1938, 1939, 1940, 1946, 1947, 1948, 1949, 1950, 1957, 1962, 1967, 1968, 1969, 1977, 1978, 1980. Until August 1988 there had been changed names of 521 Turkic populated areas on the present Armenia terri­tory. Due to Armenia Republic Supreme Council’s decree dated April 9, 1991 names of still 90 Turkic settlements were changed. 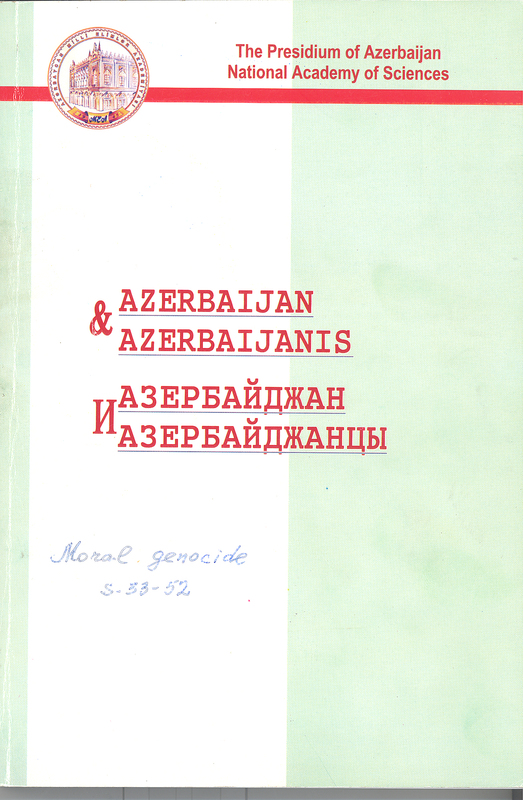 Totally, up to now names of 668 Azerbaijani populated areas in Armenia were’changed and Armenianized to imply moral genocide against Azerbaijani toponyms. 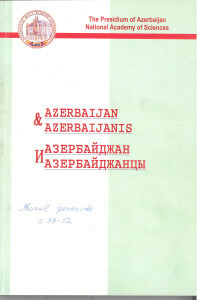 The below list presented to the reader was compiled on the basis of “Armenian SSR administrative-territorial division” book’s publications of 1971 and 1988, as well as documents of Armenian supreme legislative bodies. 1 .In the first turn there was paid particu-1 lar attention to changing names of the settle­ments bound up with Turkis ethnogenesis, its historical past. For example, name of Ashaghy Turkmanli village was changed for Lusagyug (Echmiadzin district), Orchulu vil­lage for Mrgashad (Oktemberyan dist. ), Sardarabad vill. for Oktember (Oktemberyan dist. ), Bayandur for Vagadur (Goris dist. ), Shirvanjyg for Lernakent (Artik dist.). 2.Names of many populated areas were literally translated into Armenian: Armudlu -j Tandzut (Oktemberyan dist. ), Dashgala -Karaberd (Ani dist. ), Darakand – Dzoragyug (Gugark dist. ), Darachichak – Tsakhadzor (Razdan d.), Got – Lichk (Martuni d.), Gullubulag – Vardakhpuyr (Gukasyan d.). 3.In Soviet times names of some populat­ed areas were changed to be in accordance with Soviet ideology, under the veil of “inter­nationalism”. For example, Qaragyshlag -Dostlug (Masis dist. ), Sultanabad – Shurabad (Amasiya dist. ), Cujakand – Qyzylshafag (Kalinin d.), Ashaghy Nejili – Sayat-Nova (Masis d.), Chanakhchy – Sovetakert (Ararat d.). The process was conducted along with modernization of some Armenian settlements’ names. 4.One part of the populated areas’ names was changed for resembling, but Armenianized names. For example, Darabbas – Darbas (Sisyan dist. ), Dalilar -Dalar (Artashat d.), Alayaz – Aragats (Talin d.), Aravuz – Arevis (Sisyan d.), Gabud -Kapuyt (Vayk d.), Chyrpyly – Jrapi (Ani d.). 5.Before the names in the above-men­tioned “Armenian SSR administrative-territo­rial division” publications “yukhary”, “ashaghy”, “boyuk”, “kichik” words were given in the Armenian language, i.e. corre­spondingly “verin”, “nerkin”, “mets”, “pokr”. Thus there was suggested idea that the changed names are as if Armenian toponyms. For example, Verin Zaghaly – Akhpradzor (Vardenis d.), Nerkin Zeyva – Artashen (Echmiadzin d.), Mets Kapanakchi -Musaelyan (Akhuryan d.), Pokr Shishtapa -Pokr Sepasar (Gukasyan d.). And we gave in the below list these names not as in the above-mentioned publications, but as in orig­inal. Turkic villages were deleted from the list of populated areas. For example, pursuant to Armenian SSR Supreme Council decree dated February 5, 1978 names of Ashaghy Kilsa (Gugark dist. ), Aghtala (Kamo d.), Rahimabad (Masis d.), Qamyshly (Vardenis d.) villages were deleted from the list of set­tlements. In the above-mentioned publications names of Turkic settlements were purposely so much distorted that it became impossible to identify Turkic origin of the toponyms. In the below list we tried to restore the distorted names. Azerbaijan & Azerbaijanis. №1-4, 2006, p.33-35.